Some like shorts that go over the knee. Here be some, based on the good ol' M65 trousers. Cyclists like knee pants. These are good for that too! This is Brandit's shorty version of the legendary M65 trousers. Along with some length off the pants, these are also full cotton and have civilianlike features that are only for looks without any function, but the latter isn't enough to ruin a good set of shorts. Really comfortable cut. These have bellows on knees, which enable you to do hurdles, not that we've tried. Anyway, there's no restriction of movement with these, so if you're an urban ninja, these are perfectly good for you. Two side pockets, two back pockets, two big cargo pockets. 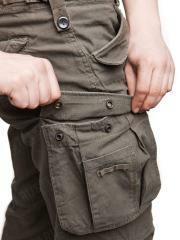 One external pocket atop each cargo pocket. 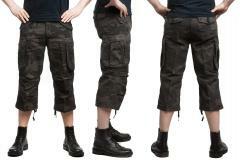 Back and cargo pockets close with press-button flaps. The side pockets have them flaps too, but the flaps are only for show (!) and the actual access to the pocket is behind the flaps. Good choice, we do not know why they left the flaps. Belt loops, tightening thingies on the sides and loops for hook suspenders. Brandit has had the good sense of keeping the M65 trouser liner buttons, so if you want to use the M65 quilted liner, go ahead - the liner stops where the pant ends stop. We've been wondering why there are no warm lined winter shorts available, but now there's no need to look further! You have to buy the liner separatedly, though. Tightening cords on pant ends. Pro tip! 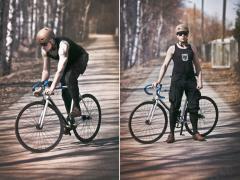 These are actually pretty good cycling trousers. Couple these with knee socks and you've garbed your whole lower body. These shorts/knee pants allow for free leg movement, and won't obviously snag on the chain. Sizes run pretty small, we've given the largest waist circumference in cm after every size. Don't take any bit too small! Measured 5 cm below your navel. Fabric is 100% cotton and these are stone washed, like with stones. Because of this, be sure to shake off the sand remains from the pockets before you get your expensive-as-hell smartphone all scratched up. Juuri sopivan pituiset housut myös hieman viileämpäänkin kesäsäähän! Taskuja riittää ja niihin mahtuu myös se isoinkin älyluuri ilman ongelmia. Nappitaskut pelkkää plussaa. Lekan 3/4 housuista ne paremmat. Leikkaus toimii, pikkutavarat pysyvät taskuissa, ja nepparinapit ovat riittävän jämäköitä etteivät aukea itsekseen. Huonona puolena että näitä ei ole varastossa just silloin kun edelliset hajoavat.